Despite reports of stone pelting and threats, a large number of voters turned up at polling booths in Jammu and Kashmir on Thursday. An elderly man pushing his wheelchair to reach the nearest polling booth in Baramulla district of Jammu and Kashmir and an excited voter dancing his heart out while casting his vote presented a different picture of the valley which has seen a record number of deaths and violence in the recent times. A 24.4 per cent voter turnout was recorded in the two assembly constituencies till 11 am. 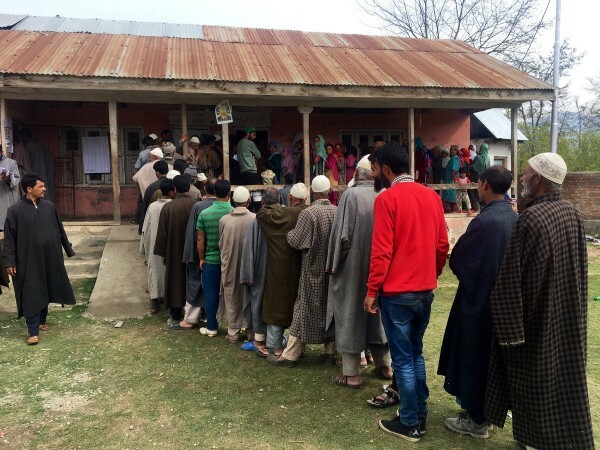 Long queues of voters in Baramulla, Kupwara, Bandipora assembly segments of the North Kashmir constituency were witnessed since the wee hours despite reports of petrol bombing and stone pelting in the region. Various militant outfits, including Hizbul Mujahideen and Lashkar-e-Taiba, had warned the people not to participate in the Lok Sabha elections. On the other hand, many mainstream political leaders, including Omar Abdullah, Mehbooba Mufti and Farooq Abdullah, have urged the voters to defy the protest call and come out to exercise their franchise. A sizeable population of Kashmiri Hindu migrants originally from Baramulla and now settled in Jammu and Delhi have been asked to vote from their respective locations. Two polling booths were set up for the migrant voters in Jammu region. There are 13.2 lakh voters in the Baramulla constituency which is seeing a triangular contest between the seasoned political leader, Mohammad Akbar Lone of National Conference, Engineer Rashid who is an independent candidate and an ex IAS officer, Raja Aijaz Ali of Peoples Conference. Interestingly, Engineer Rashid who is also an ex-MLA has received support from former IAS officer, Shah Faesal. Rashid has been a controversial figure as he openly supported the separatist Hurriyat leadership in the valley and at one point even supported the plebiscite in the valley, termed as anti-national by the right wing groups. The BJP is almost virtually non-existent in Kashmir but is still the strongest party in Jammu constituency. The BJP vote bank may however be dented by the Muslim majority regions of Poonch and Rajouri in Jammu region casting their vote in favour of Congress and other regional parties. The BJP had swept the Lok Sabha polls and State Legislative Assembly elections conducted in Jammu region last time.